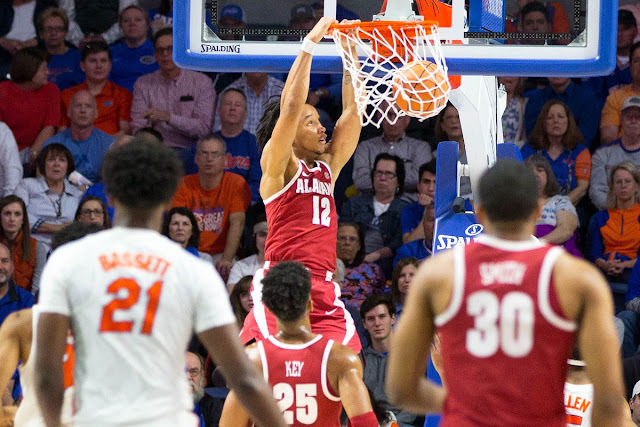 This crazy, random Alabama men's basketball season continues following their big win in Gainesville over the weekend. The team will next travel to sunny Starkville, Mississippi on Tuesday night for a return game vs Mississippi State. Alabama won the first matchup 68-62, and enter this game with a 6-4 conference record. State enters with a 5-5 record, and have won three straight. Game time is 6 P.M. CT. SEC Network will televise the game. Swallow your pride and click those links for team and KenPom stats. My Two Cents: I have no idea. Trying to figure out what you're going to get from this Alabama team is an exercise in futility. If inconsistency breeds among the young, there is no greater example than this team. Saturday was a microcosm of this season. Alabama was pretty bad in the 1st half, turning the ball over fifteen times. Fortunately, Florida didn't play much better, and Alabama only trailed by six at the break. If Florida goes into halftime with a double digit lead, I'm not sure Bama comes back to win. Or maybe it wouldn't have mattered. Our guys smashed Florida in the face with a brick in the 2nd half, outscoring the Gators 41-17 en route to the largest margin of victory ever by an Alabama team in Gainesville. However, I'm not going to get too excited because we've seen this movie before following big wins. Will Tuesday night be any different? The win in Gainesville did take a little pressure off the game in Starkville. With nine games remaining, I thought the four game stretch beginning at Florida and ending with a home game vs LSU would be important. I thought Alabama needed to go 2-2 in that stretch, and at least 2-3 in the final five game stretch that includes road games at Kentucky, Auburn and A&M, along with tough home tests vs Florida and Arkansas. With the quality wins already on their schedule, plus their overall schedule strength, I figure 18 wins is the magic number for Alabama to feel positive about their postseason hopes heading into St. Louis. If Alabama can find a way to consistently play at the level they did in the second half on Saturday, they should easily reach or surpass that number. If. Players to Watch: Collin Sexton may not be at 100% right now, but he's been fantastic in the last three games, averaging 19.3 ppg, 5 rpg, 3.3 apg, and 1.0 spg. That game at Florida was arguably his most complete day of the season, as he scored, rebounded, made some sweet passes that led to baskets, and played under control, even with the poor overall play of the team in the first half. I think we were all worried at various times this season that Collin's expected lone season in Tuscaloosa may not include an NCAA tournament appearance. It's not set in stone yet of course, but Collin's doing everything in his power to get this program to that finish line. Despite the ups and downs of the team this season, it's been a joy to watch this young man play the game of basketball in an Alabama uniform. You may remember Lamar Peters leading the charge for Mississippi State in the first game at Coleman when the Bulldogs came storming back from a 19-point deficit in that game. Peters was on fire again this past Saturday vs Georgia, finishing with 20 points, 2 assists, and 4 steals. At times I watch Peters and wonder if he's a legitimate SEC guard, and then he has games such as he did against our guys in Tuscaloosa, and the game he had on Saturday, and I realize I just need to stop thinking that. Peters can play, and if this goes south for Alabama on Tuesday night I won't be shocked if it's largely because of his performance. Prediction: The way this season has gone, I should just drop this portion of the previews because it's become impossible to predict what will happen nightly in this league. In that way, Alabama is perfectly in harmony with the league in that nothing makes much sense. Auburn and Tennessee (picked 9th and 13th in the preseason poll) are at the top of the league, while Florida, Kentucky and pretty much every other team is chaos theory in action. However, I like to predict the games for a bit of fun. I actually went back to see what my record was in picking the games and was surprised to see that I have a 16-7 record in picking the winners this season. Better than I thought. Only a game off from Alabama's current win/loss record. Having read that now, you should bet your house on my predictions going forward....totally....no worries.